NOTE: This vehicle is diagnosed using the CONSULT-III plus. 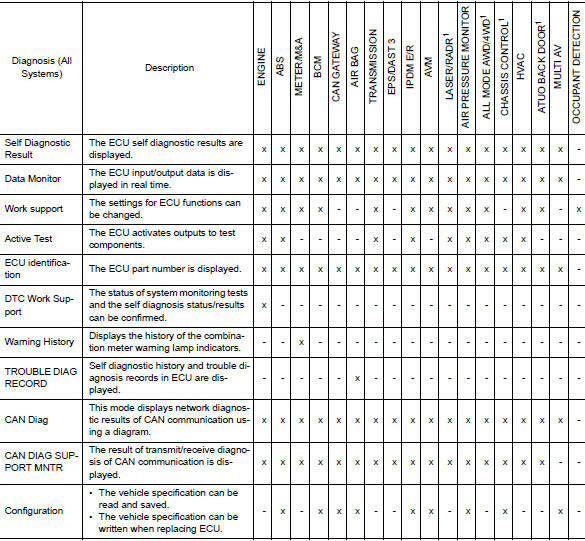 When CONSULT is connected with a data link connector equipped on the vehicle side, it will communicate with the control unit equipped in the vehicle and then enable various kinds of diagnostic tests. Refer to “CONSULT-III plus Operation Manual” for more information. If the CONSULT cannot diagnose the system properly, check the following items. CONSULT cannot access any system. Open or short circuit CAN communication line. 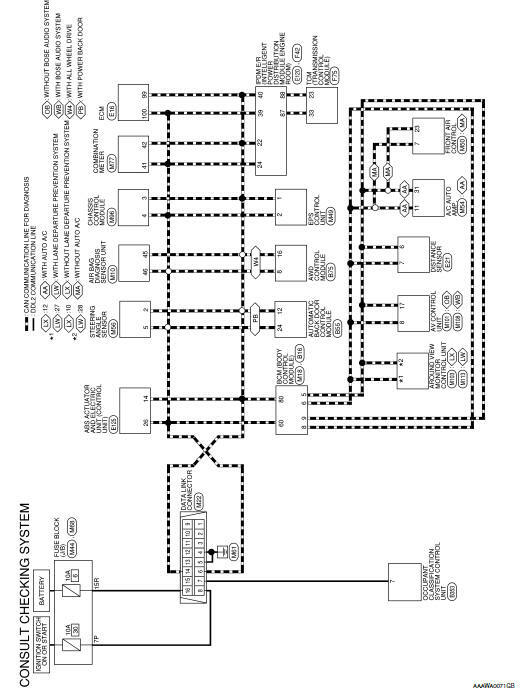 Refer to LAN-17, "Trouble Diagnosis Flow Chart"
NOTE: The DDL2 circuits and CAN communication lines from DLC pins 6, 7 and 14 may be connected to more than one system. A short in a DDL circuit or CAN lines connected to a control unit in one system may affect CONSULT access to other systems. For a complete DDL circuit layout, refer to GI-51, "Wiring Diagram - CONSULT/ GST CHECKING SYSTEM". For a complete CAN line layout, refer to LAN-35, "Wiring Diagram - CAN SYSTEM -".